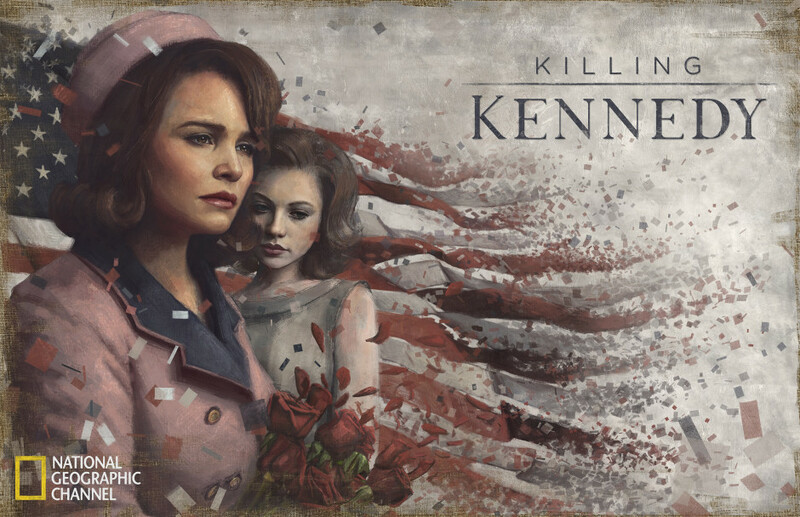 Working on the campaign for the upcoming movie “Killing Kennedy” on The National Geographic Channel is another great case study of collaboration and creativity. In Part 1 of this post, I covered in great detail the print, key art and video portion of the production. As I’m always looking for new stories and takeaways (and collaborators) to talk about, this entry takes on a whole different aspect of the campaign. COLLABORATIVE PARTNER – SAM SPRATT. Before I get to the marketing, challenges, and takeaways, let’s talk about Sam Spratt, who is really the main subject of this post. I first ran across Sam’s work on Twitter, and then Tumblr, and after digging into his portraits and paintings I knew that I would find a project sometime, somehow, that would be perfect for his talents. It didn’t take too long before I discovered that Sam was a good friend and collaborator with Joey L., our photographer on Killing Kennedy. They had partnered together on some projects, and clearly he had a similar creative style and operating principle – “we’re in this together.” When the creative development for “Killing Kennedy” began to ramp up, the opportunity was too good to pass up. The goals remained the same for the campaign: make the film feel big, like a Hollywood movie. 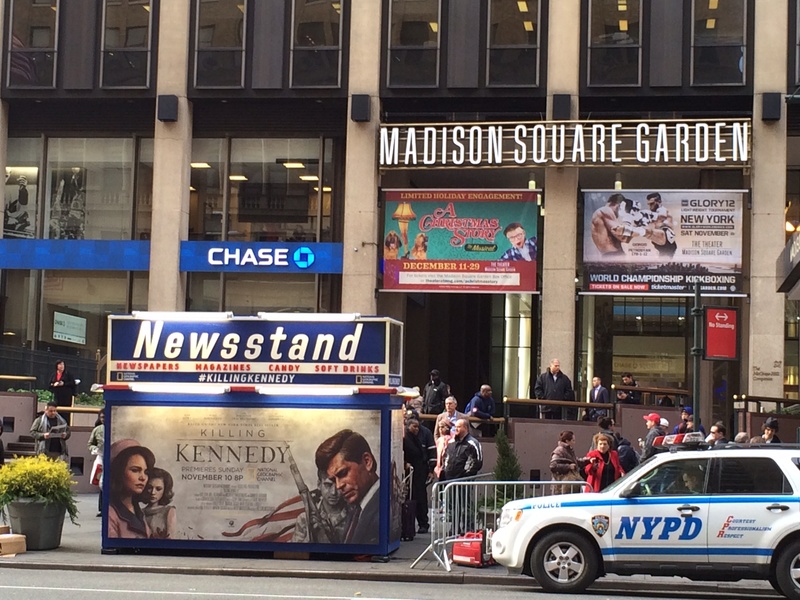 Sell the dual nature of the story – not only was it the Kennedy story, but also the Oswald story, one not known as well. We had accomplished those goals so far with our more classic elements in TV and print. However, when it comes to this creative element I’m writing about, I’m going to be pretty honest. There was not a strategic goal, or an underlying objective that would work with our media plan. I simply hired Sam because I thought what he could bring to the campaign would be really cool, and I knew that we’d find a place for it in the mix of elements once we finished it. (Spoiler alert: more on this later in my “Takeaways.”) Sure, that can be a risk, but in this case it felt like the perfect match between assignment and creative. 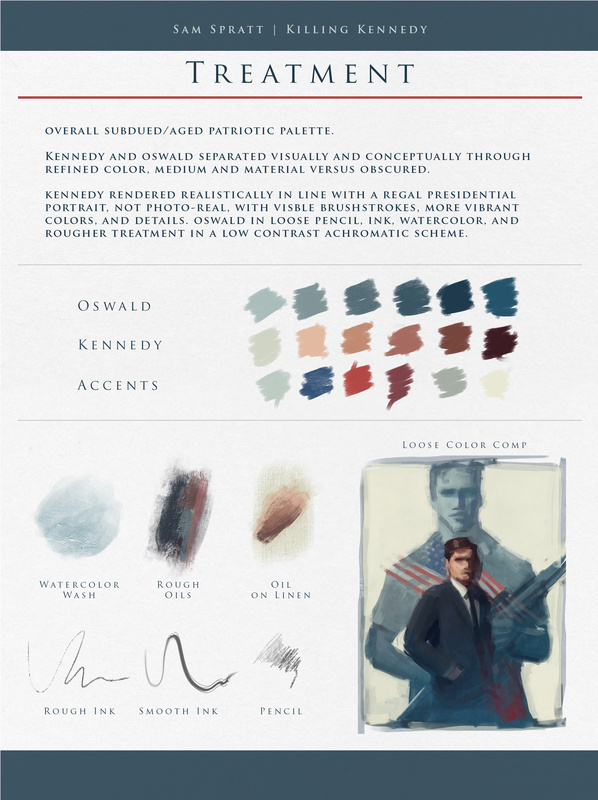 What I wanted to do was a portrait of JFK and Oswald – something purely creative, unique and memorable, to capture some of the emotion from the film. We also wanted to do a companion poster featuring their two wives, Jackie and Marina. Having seen some examples of portraits that Sam had done, I knew it would work. What I loved was that he could paint well-known figures, but always give a little twist to the image that took it beyond a simple rendering of a familiar person. 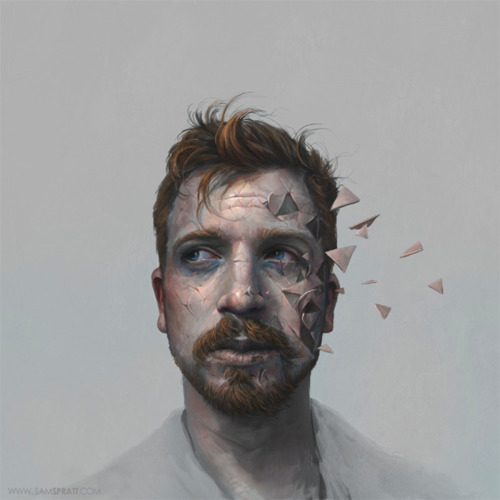 Here are some examples of Sam’s work that demonstrate that twist that takes it beyond just straight portraits into something more reflective of deeper themes and meanings. 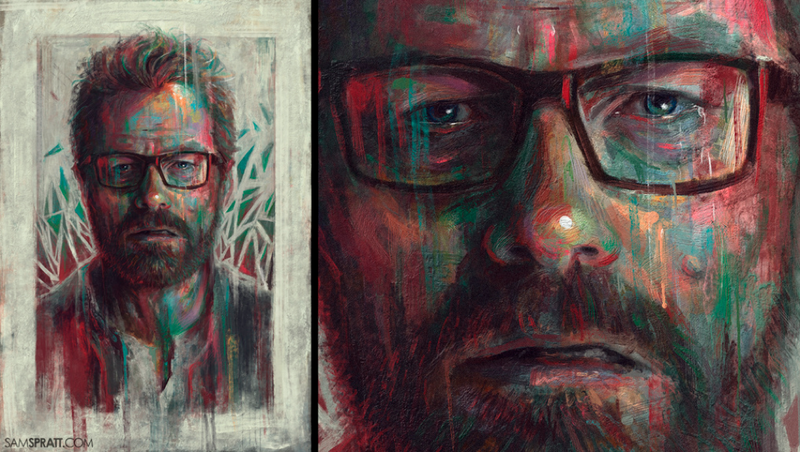 Breaking Bad meth kingpin Walter White, painting by Sam Spratt. 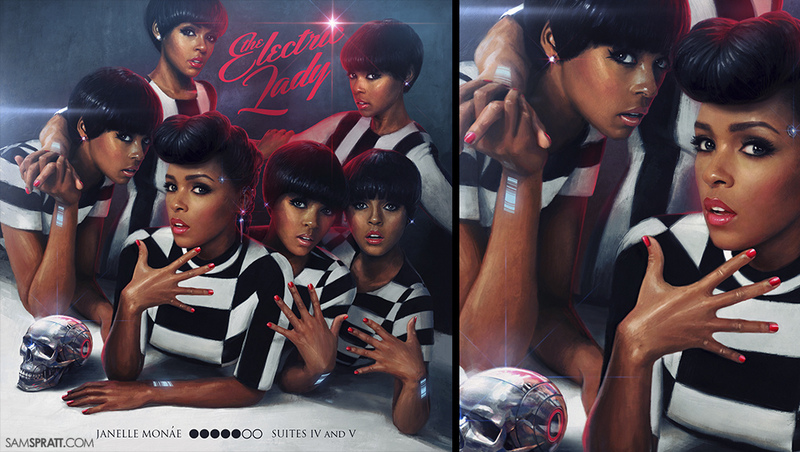 Janelle Monae “The Electric Lady” album cover by Sam Spratt. 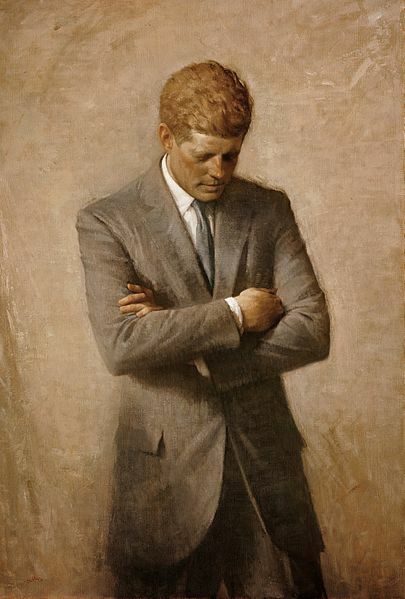 Portrait of JFK by Aaron Shikler. 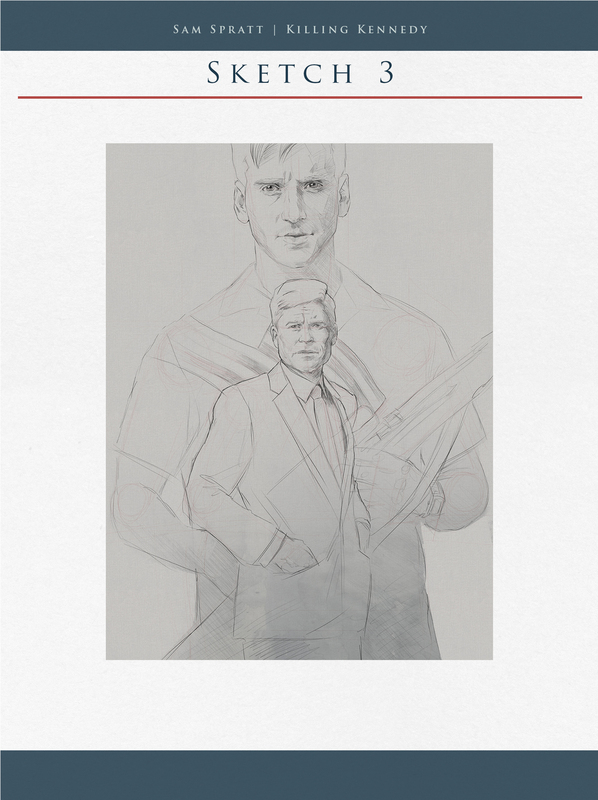 We wanted to make more of a movie-poster portrait, featuring the two main characters of the film, and adding some more stylistic elements that would speak to the film’s deeper and more resonant themes. As Rob Lowe has said before about his JFK performance, it is less about imitation and more about inhabitation. The other challenge was just figuring out what elements we could add to the portraits that would serve as the ‘twist’ to imply deeper meaning – and that would also connect the two images so they could work together. TAKEAWAY #1: STEP AWAY AND LET SAM GO. Conceptually, most of the groundwork had already been laid by Joey L’s shoot – we had tons and tons of imagery to pull from to determine what that composition would be. Sam’s job was just to translate those ideas into illustrations. Like any painting, he began with sketches. (Please note, from here on out, all quotes in this entry are directly from Sam) “I explored silhouettes, character hierarchy, and mostly balanced/symmetrical ideas.” So we looked at a range of sketch concepts, and there was one clear winner among them. The three initial sketch concepts. Color treatments and brush stroke suggestions from Sam. TAKEAWAY #2: DO YOUR HOMEWORK. After our initial briefing, Sam knew that the goal was to ride that line between JFK and Rob Lowe. At National Geographic, authenticity is clearly a brand hallmark, so Sam did his homework. 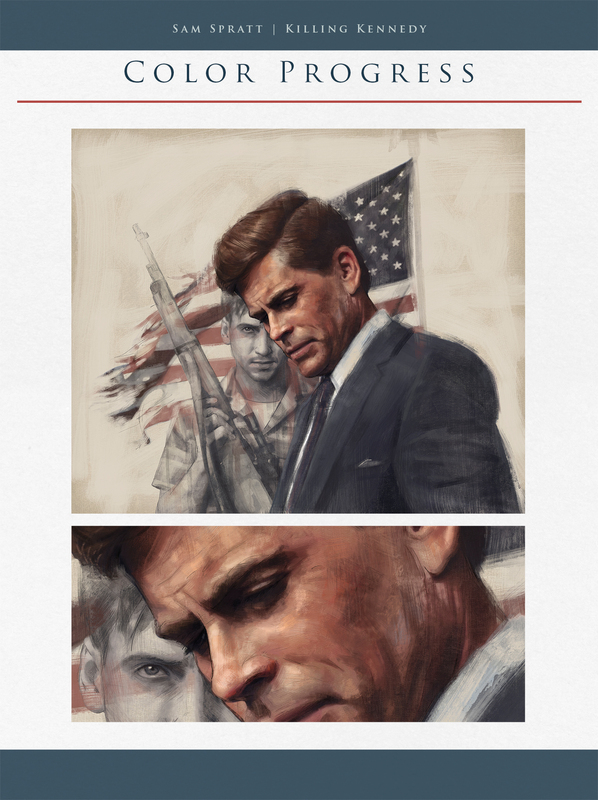 “I did basic revisions to the two figures by studying their respective historical counterparts’ anatomies and bringing elements of that in – despite Rob Lowe’s already pretty impressive likeness to JFK, the luxury of painting a portrait instead of shooting one is that we could bring more of Kennedy’s features in – jowls, earlobes, nose, lips, brow, hair line, hair style, baggy eyes, etc. 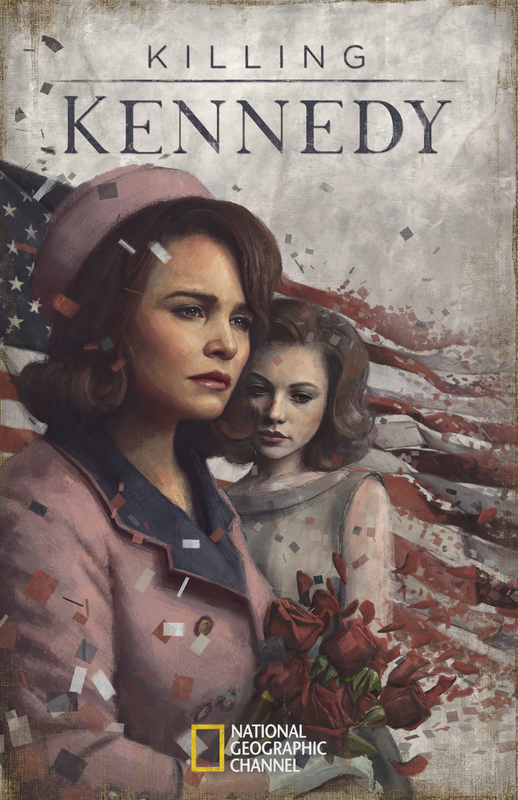 And do so all only so far as to blur the line between the two and hopefully give an instant read of Kennedy from afar and Lowe as Kennedy upon a second glance. I used a color palette and technique that was era appropriate, leaving darker areas with thinner color letting the underlying canvas show through, and the more vibrant highlight being thick and textural. When we later moved on to the female portrait, the same principals applied but with a lighter touch to accommodate their smoother features. In fact, Ginnifer’s skin in particular is so porcelain perfect that I had to paint it far rougher than it actually is.” Sam studied in great detail the anatomy and look of both our actors and the individuals, and the final result reflects just that. Initial sketch concept for the ‘female’ portrait by Sam Spratt. TAKEAWAY #3: COLLABORATION IS AN ARTFORM UNTO ITSELF. Other than the general revisions we had for positioning and head angles and such for our figures, the real key to the success of the paintings lay in the ‘twist’ I spoke of earlier – and that was the flag. The American Flag is an obvious icon to use when creating a Presidential portrait, but we set out to treat it in a new way. 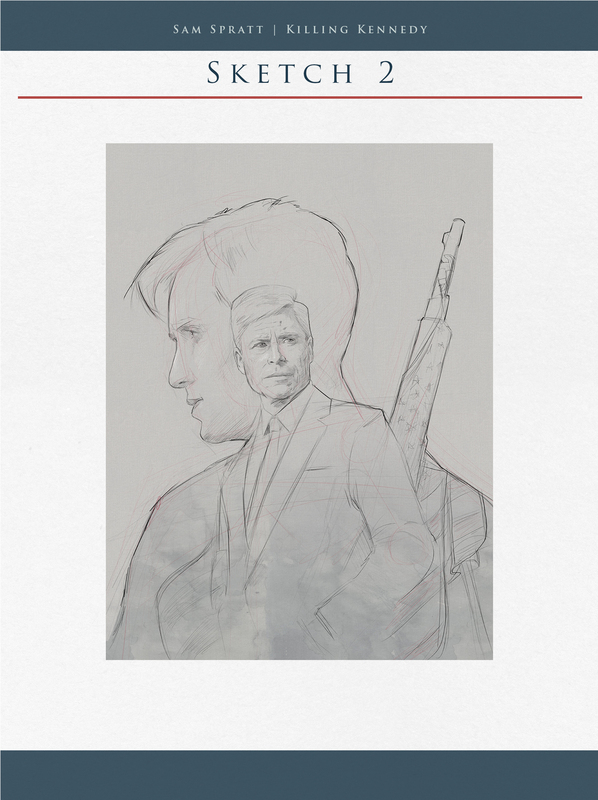 Sam had initially sketched it as a solid flag, but after we had done so much thinking previously on the TV and print campaigns, the idea of the assassination “tearing apart America” gave us some ideas on how the flag could be re-interpreted. We asked for some examinations that would have the flag ripping apart rather than in pristine condition. Sam was of course totally into it, and his first initial sketches and color samples had the flag tattered and torn, almost disintegrating at the edges, as if it had been whipped by wind and beaten down. Early version of the male illustration with tattered flag. But when I saw the tattered flag, it didn’t feel right. It felt a little too much like a tattered pirate flag – and while I may have been been guilty of overthinking it, I also felt like the assassination of JFK was a sudden, stark moment. His death wasn’t a long, drawn out, tattered process – it was immediate, and the ‘seams’ pulled apart quickly. I imagined the flag coming apart at the stripes, more of a bold separation than fibrous distortion. After a very quick 2 minute phone conversation with Sam (while I was standing at LAX airport searching for a charger) we were on the same page and as always, Sam was totally into it. “I like to be able to reference how things work before I draw them in most instances. In the case of this painting of the flag I wanted to understand the physics of it. To do so, I tore up a pillow case into several strips, and while perhaps a high-powered fan would’ve done the job, I pranced (literally pranced) around the room waving the cloth around and took note of its behavior. Prancing worked, we got the flag to where we wanted it, and it was smooth sailing from there.” So while takeaway #2 could have easily been “prance around with fabric strips to learn their motion behavior” I think that the collaboration and flexibility on Sam’s part to conceptually deliver what we all wanted was huge. After he nailed the look, we had some of the ‘tendrils’ wrap around the gun barrel to add an extra integrated look. 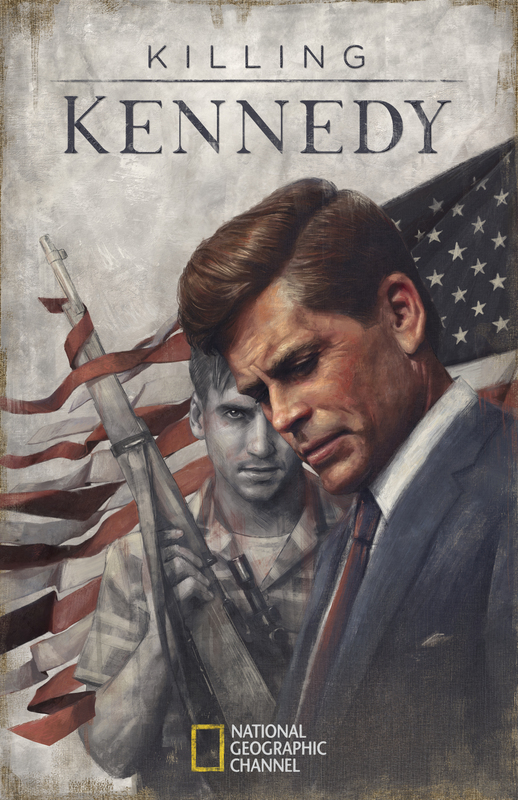 Final painted image of JFK and Oswald, by Sam Spratt. TAKEAWAY #4: LOOK TO YOUR OWN CAMPAIGN FOR INSPIRATION. As I mentioned earlier, much of the campaign’s heavy lifting had been done with our shoot in June with Variable and the Mill, and as we moved past the JFK/Oswald illustration, we now needed to create the Jackie/Marina portait. Luckily, this part of the process went quite quickly, as we knew we wanted an almost identical pose, but just flip-flopped so that they could be mirror images of one another. We had the flag, of course, but what we weren’t sure of was what to DO with the flag. We still liked the idea of that “tearing apart” notion from the film, but didn’t want to use the exact same execution. As we thought about it a little more, the answer became obvious. In our video shoot with the talent, we had used confetti flying along the parade route as a way to A)demonstrate the optimism in America before the assassination and B)As a means to show the reverse path of the bullet – having confetti rise/float helped sell that idea quickly. Turning the flag in the portrait into confetti at the ending tied in perfectly with that same idea already being used in all of the promos, and connected nicely to the rest of the campaign. Additionally, Jackie had a bouquet of red roses in her lap at the moment when JFK was shot, which was something we’d used in the video as well. Having Jackie hold the red roses, while petals were floating around here and merging with the red stripes of the flag was perfect. Being able to tie into those two other elements gave Sam more material to build out the painting, and transform the flag once again. Final painting of Jackie and Marina, by Sam Spratt. TAKEAWAY #5: CREATIVE FOR CREATIVE’S SAKE – IS A GOOD THING. Someone once told me that in TV marketing we should never just do “creative for creative’s sake.” Meaning that everything should be planned, and meticulously targeted, and done with a distinct purpose or audience in mind. Well, they were wrong. Yes, much of what we do needs to be all of those things – strategic, targeted, integrated, etc, etc. But sometimes it’s perfectly fine to do something – just because. To explore a creative path, and get lost in it, and when you come out the other side, you may have something really special. It’s the only way you’ll be able to take risks and discover something that you wouldn’t have if you’d been focusing solely on the brief or the audience profile, or whatever it might be. Sometimes you just create something (or in this case, commission something) because it seems like it’s just going to be cool, and will get attention just for what it is – not for a target it may or may not hit. That’s something that’s easy to forget sometimes. And this aspect of the Kennedy project was done just because, to try something new and play in a new space creatively that we hadn’t before and to work with an artist who does incredible work. And it proved once again that doing creative for creative’s sake can be a very good thing to do. 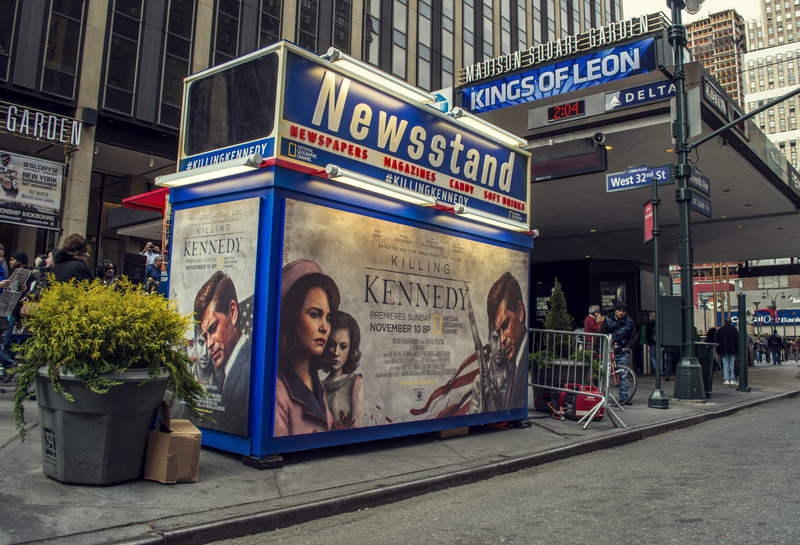 Photos of the period-appropriate Newsstand in NYC. Overall, the creative process with Sam was not only seamless and collaborative, but also a great creative learning experience for me. Thank you Sam Spratt for all of your incredible work on this project, painting an American Icon. 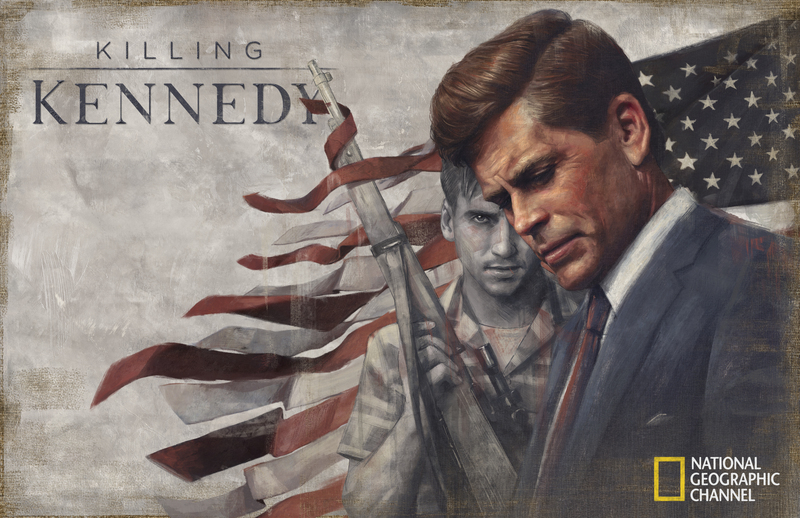 Final horizontal JFK/Oswald artwork by Sam Spratt. Final Jackie/Marina horizontal artwork by Sam Spratt. The casting of Oswald seems too good looking. Oswald said he was a patsy which adds a whole other dimension to this story whether true or not. His jawline was a little weaker in real life and for me this projected a kind of subtle visual cue to the personality flaw which led to whatever compelled him to do what he did. Was their any talk of this? Casting the talent is more of a function of the show production team – by the time it comes to my team, it’s sort of inconsequential – I will say that Will’s performance in the film is fantastic, and I’m sure he’d love knowing that he’s too good-looking to be Oswald! 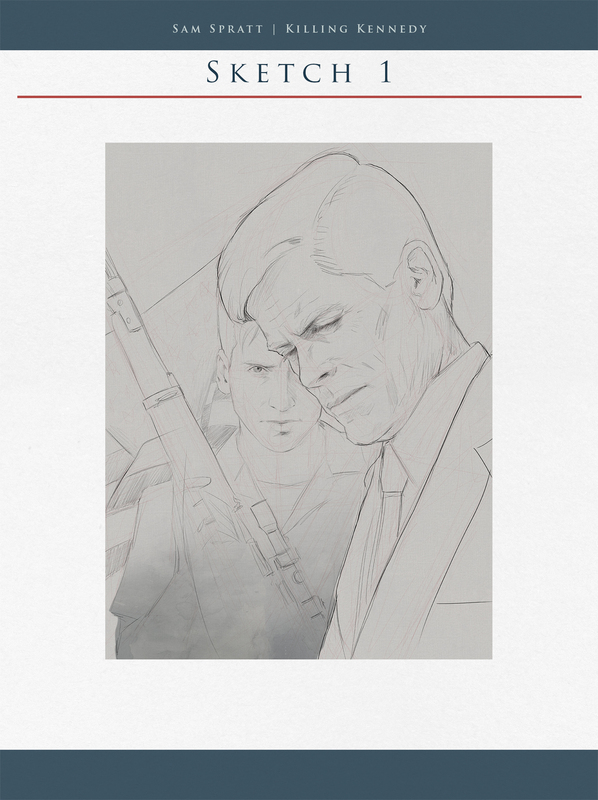 Great post on the process of producing key art for a campaign. P.S. I’m a HUUUUUGGGE fan of Sam Spratt’s work. So good, honestly the Sam artwork makes me want to check it out, havent said that in a long time..good on you for doing something different. Beautiful work! Can’t wait to watch it. Andy, thanks for taking the time to describe the development of this work so thoroughly! You certainly picked the right illustrator in Sam Spratt! Wonderful talent and person… those of us who know him can only smile and nod while reading your account. As an illustrator and educator myself, it’s incredibly valuable to see your world… you’re completely right when you say there’s a missing voice out there – the voice of true collaboration! Thank you for showing the value of collaboration… I’ll be spreading the word about your blog! Wow, thanks for the kind words John! Glad you enjoyed the post, and thanks for sharing! This is just fantastic. 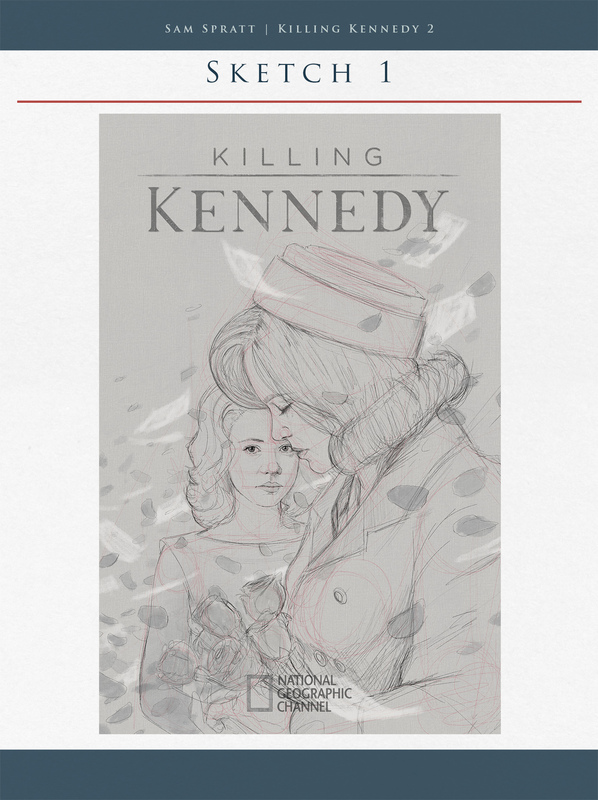 Thank you for taking the time to write what’s going on behind Killing Kennedy. I’m a marketing student and an illustrator/graphic designer and this was very educational and inspiring for me. 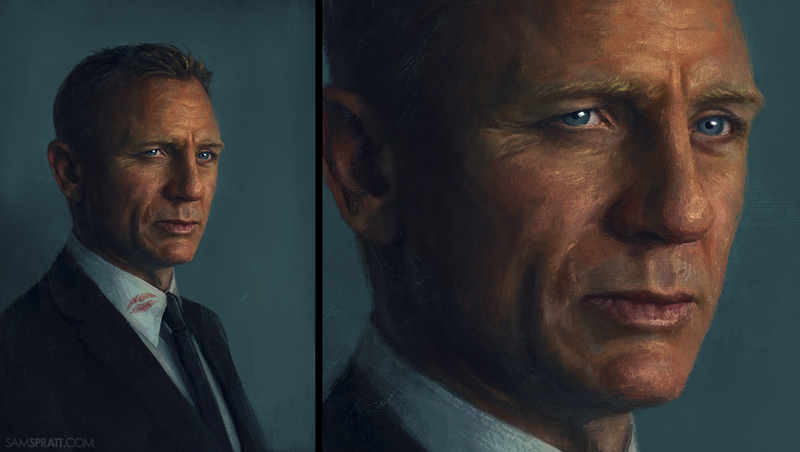 Sam Spratt is a genius and I’m so glad he was your choice to portrait such an iconic character. Thanks again! I’ll be sharing this with other students!